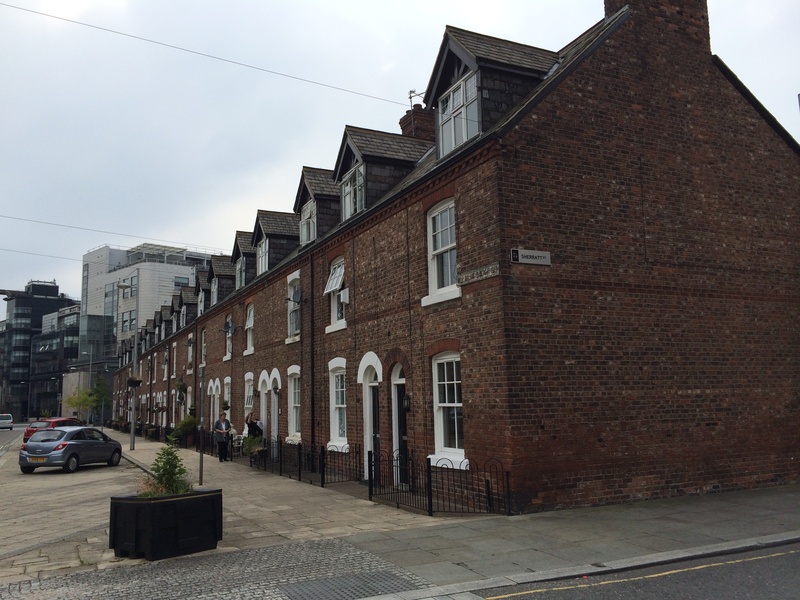 This was Ancoats, on the eastern fringes of Manchester, a place affably known as the world’s first industrial suburb. In just over 50 years from the late 1700s mills, factories and housing sprung up on open fields and newly-built canals criss-crossed the landscape. Indeed, when Frederich Engels visited the area in 1842 he found “the largest mills of Manchester, lining the canals, colossal six and seven storied buildings towering with their slender chimneys far above the low cottages of the workers.” The grid-like pattern that is still evident shows how it was divided into plots for development by individual firms and people. Today, the mills have long ceased functioning as bustling workplaces where cloth was spun, woven into textiles and exported all over the world. But many of these wonderful, towering buildings from the 18th and 19th centuries survive and are starting to find new uses; as apartments, offices, small workshops and even a coffee shop. 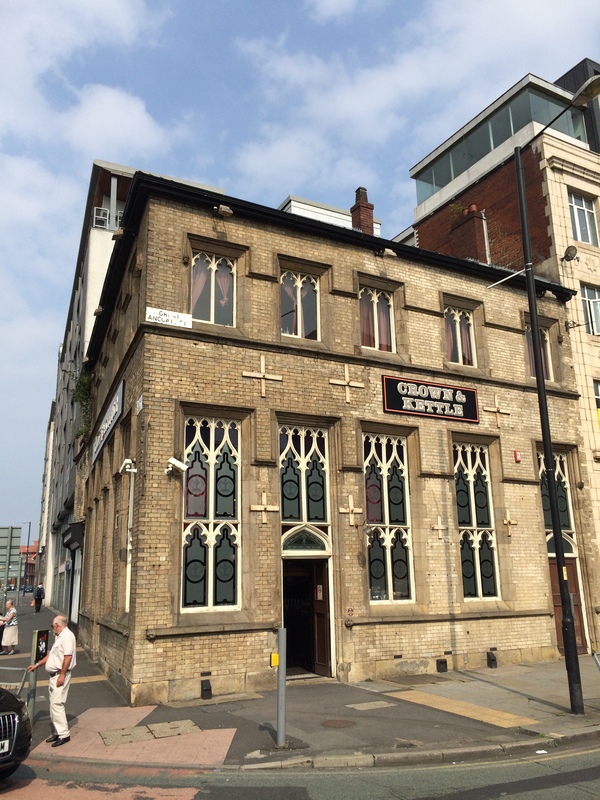 The Crown & Kettle pub on the edge of Ancoats is particularly wonderful and is bustling with fine real ales. But while there has been much progress in the Ancoats conversation area (the protected section where the original mills stand, above Great Ancoats Streets, sandwiched between Oldham Road and the Rochdale Canal) the transformation is far from complete. Many former industrial buildings still lie empty. And some local residents still see Ancoats as a ‘no-go’ area; barely a place they’d want to walk through, let alone a place they’d want to live. It was the arrival of Adam Murray, a Scottish machine-maker, in 1790, and John McConnel and John Kennedy, also Scottish engineers, several years later that brought real transformation to the area. By 1816 these two camps were each running firms with more than 1,000 employees – at a time when the average Manchester mill had 300 workers. All in all, it was a massive leap forward from the scale of production at the world’s first factory at Cromford Mill, Derwent Valley, a place I visited recently. Other mill owners would follow the two firms to Ancoats, leaving the centre of Manchester as an area of warehouses (with showrooms) and other commercial offices. 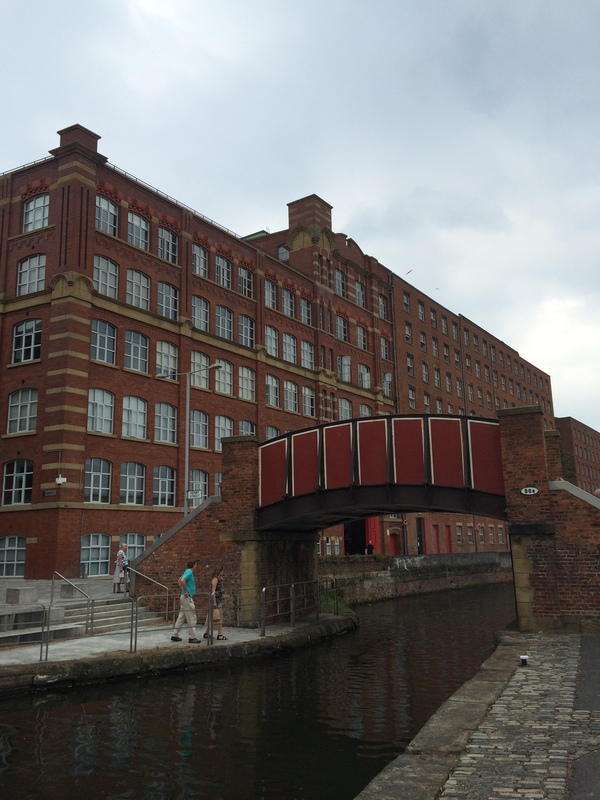 McConnel and Kennedy began building first, rapidly expanding across plots north of Henry Street and adjacent to the Rochdale Canal, a crucial stretch completed in 1804 which linked to other waterways in the Manchester area. They used powerful Boulton and Watt’s steam engine and were the first to use powered spinning-mules, providing a considerable boost in power compared to Arkwright’s water frame. Royal Mill (built on the site of the original, 1797 mill and re-named following a war-time royal visit in 1942) has now been converted into luxury apartments. But as McConnel and Kennedy’s original mill was re-built in 1912, the A & G Murray’s (Adam formed a partnership with his brother George) first building stands as the oldest surviving steam-powered mill in the world. Built from 1798, it would have had spinning machines on the upper floors, with preparatory processes such as cleaning and carding carried out on lower levels, as was the case at the mills owned by McConnel and Kennedy. According to an 1811 survey, the Murrays operated 84,000 spindles on their mules, at a time when most spinning firms in Manchester each had fewer than 10,000 (the same research showed that McConnel and Kennedy had 84,000). An off-shoot of the Rochdale canal was rooted underground so that barges could load and unload right underneath the factory meaning that little time was wasted (the basin can be seen behind today behind the former mill complex). While the Murrays’ mill buildings have had some use in recent years, by theatre companies for example, they are today off-limits for visitors who want to marvel at this important industrial heritage. The individual windows are boarded up, the main site fenced off. But through the hoardings you can see in the distance the site’s offices with fine Georgian bay windows, next to it the gate where workers clocked in each day for their gruelling, 12-hour shift. Given that it’s typically cheaper for developers to start from scratch with apartment or office blocks there may be some waiting before any building takes place here. Landlords let and sublet plots of land and constructed housing at the lowest possible cost. Some of the homes were built back-to-back (similar to the design I found in Birmingham) and many residents were forced to live in unsanitary conditions in cellar dwellings. The worst of housing in Ancoats was condemned and demolished long ago, to be replace by public housing developments such as the huge modern Victoria Square – built-between 1894 and 1897 with almost 300 apartments and containing a communal internal courtyard (which when I visited seemed full of community spirit with residents enjoying seemed like a street party). But ironically many improvements to the area (which also included new public buildings like a school in George Leigh Street in 1912 – curiously with a roof top playground to make best use of space – and swimming baths) also coincided with the start of a long, steady decline of Manchester’s cotton industry. While there was a boom following the Second World War it was short-lived and by the 1960s most spinning in Ancoats ceased, although some smaller businesses remained. To many the closure of Express Printers in 1989 was the end of Ancoats as an industrial suburb. 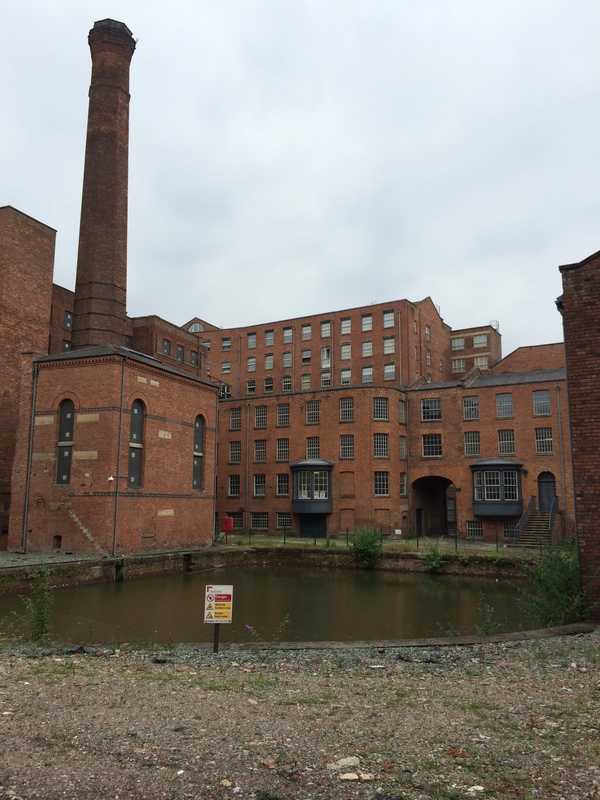 As Manchester continues to grow, property developers will no doubt be attracted to converting the former mills that currently stand empty into apartments. 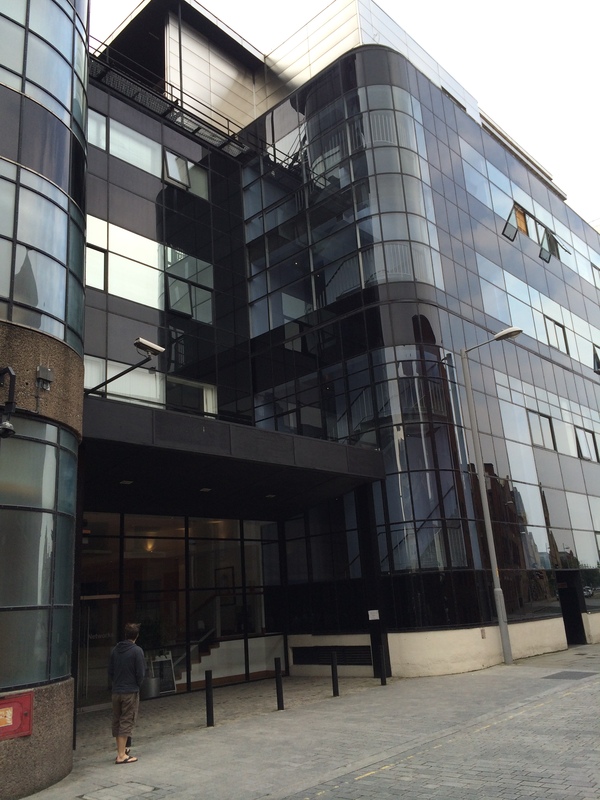 Other buildings will house more start-up businesses hoping to get a discount on the inner city rents. 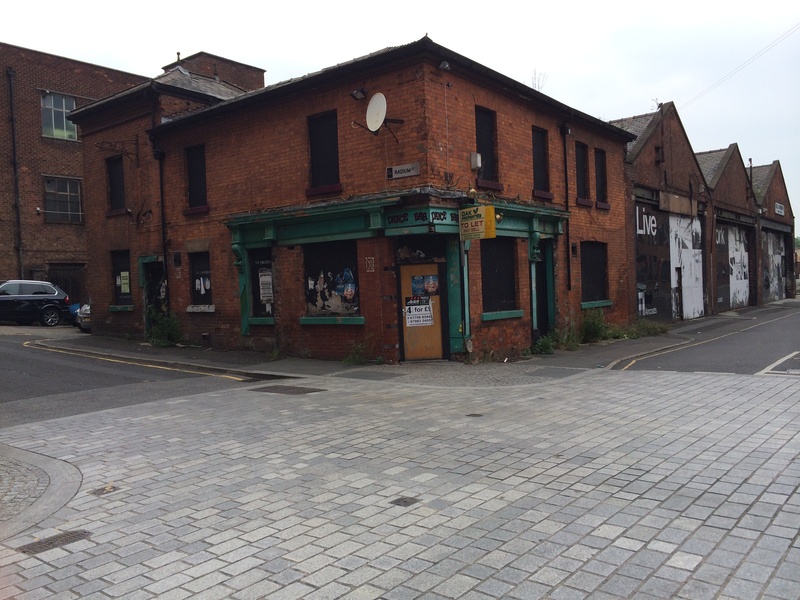 Pubs, like the boarded-up, eye sore that is Cross Keys, on Jersey Street, will be renovated and re-opened. Even if the power source has changed, one day soon that scene described by Beuth of “at night when the thousands of windows are brightly illuminated with gas light” may largely stand true again.